When I was a little girl I could not resist my mum's jewellery box. Getting her jewellery out and trying things on was one of my favourite things to do. 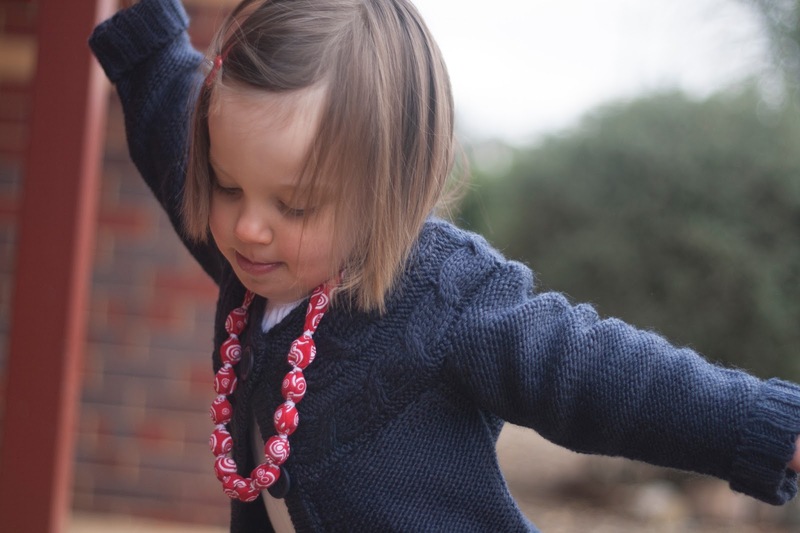 I loved to play with her necklaces and wore them around the house pretending I was a grown up. I think all girls do that. My Little Monkey is no exception. She loves to wear my necklaces. Often she wears a couple and then brings a couple for me to wear. Very cute! 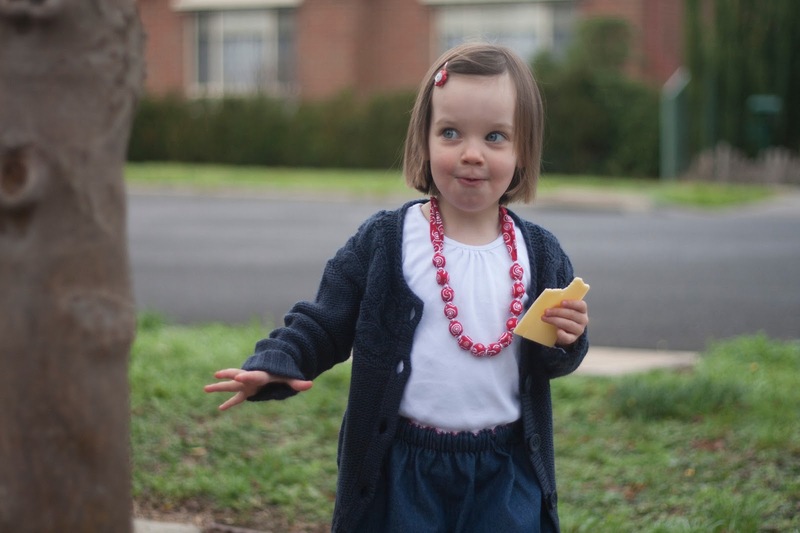 Recently I made a reversible scalloped skirt for her - the Bluebell skirt. I thought the skirt needed soemthing to go with it. A fabric covered bead necklace! Of course! I have been wanting to make one for a few months now. What a great excuse to finally do it. This necklace was very easy to make, too. Would you like to have a go? Please click Read more to follow my steps. I bought a cheap bead bracelet at one of the costume jewellery shops. The beads were just the right size for what I had in mind. I needed a couple of measurements before I could cut my fabric - the length and the width. Measuring the length was easy - I used my trusty measuring tape and put it around Little Monkey's neck as if it was a necklace and added a few cm 'just in case'. For the width, I took one bead and wrapped my measuring tape around it, taking note of seam allowances at the same time. In this case, my strip of fabric needed to be 7 cm wide, with 1 cm seam allowance on each side. I cut a rectangle out of the fabric using my measurement, folded it in half lengthwise right sides facing and pinned. Then made a tube by sewing the long edges together. ... used it to turn the tube right side out by inserting the pin with a 'tail' inside the tube and pulling it through. I used the safety pin to mark where I wanted the central bead to go. and secured the thread as I usually would when doing hand sewing. Then I secured the bead on the other side. Repeated for each following bead. Next, I tied knots on both ends of the elastic so it would not slip out. Toddlers watch with their hands. They will pull everything they can. They are the best quality control officers on the face of the earth. and stitched it closed... not once, but twice, making sure both rows of stitching went over the elastic, as I have a really keen quality control officer here! I then folded the ends of the necklace in half and hand stitched them in place. Done :) Maybe I should make myself a matching necklace? Little Monkey would love that! 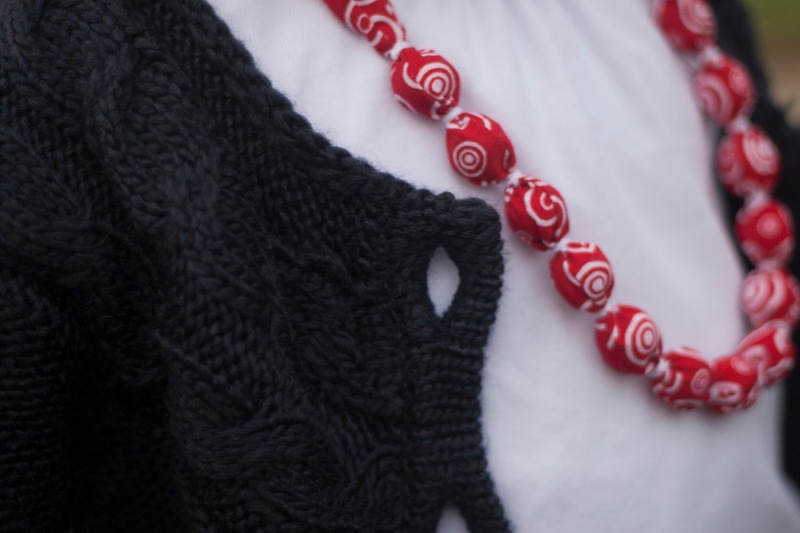 Please let me know if you make a fabric covered bead necklace using this tutorial. I would love to hear from you and have a look at the pictures (if you take pictures of your creations). I would appreciate a link back to this tutorial should you choose to use it. What a cute and fun necklace for a toddler or her mom. Thanks for sharing today. Love it!! I really should make one (or three)...thank you for sharing. I think you should make yourself one,too! I should really make one of these for my daughter! She likes necklace and someone gave her a kind of cheap bead one- but I'm paranoid she is going to chew off a bead or something..... Very cute project! Thank you so much for your tutorial! I cannot wait to make one for my granddaughters, and myself also. Your pictures of your little monkey are precious! I love your necklace. What sort of thread do you use to tie off each bead? It looks thicker than normal cotton. thank you for visiting and for your question. Sorry it's taken me a while to reply. I have just recently discovered that I have not been receiving notifications about new comments on the blog. Thanks :) There can be as many options as you like - you can make it long and tie with a bow, or add ribbons instead of elastic. I just noticed that my daughter had been pulling things away from herself then up, that's why I sewed elastic at the back for her. It made taking her necklace off and putting it back on super easy!